Christie Medical Holdings, a leader in vein-finding technology, will be exhibiting its VeinViewer® technology at the Ambulatory Surgery Center Association’s (ASCA) annual meeting, taking place at the Gaylord Texan Resort and Conference Center from May 19-22, 2016. VeinViewer can help ambulatory surgery centers provide a positive patient experience associated with starting an IV by reducing the number of stick attempts and the time required, thereby decreasing pain and anxiety for the patient. VeinViewer is the only NIR vein illuminator rated for use in multiple environments including hospitals, outpatient care facilities, homes and schools. 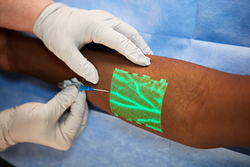 VeinViewer uses harmless near-infrared light (NIR) to detect a patient’s vasculature and then projects a real-time, high definition image of the vein pattern directly on the skin surface so clinicians can quickly assess options for accessing a patient’s veins. In post-assessment procedures, clinicians can assess the patency of the vessel to help avoid potential complications. Attendees to ASCA will see VeinViewer Vision2 and VeinViewer Flex at the Christie booth, number 109. To learn more about Christie vein finding devices: VeinViewer Vision2 and VeinViewer Flex please visit http://www.christiemed.com. Christie Medical Holdings Inc. is a global company based in Memphis, Tenn., that discovers, develops and commercializes medical technologies. The company’s market-leading product, VeinViewer, is manufactured in the USA. It is a mobile vascular imaging system that allows health care providers to clearly see accessible vasculature as a real time HD image, directly on the surface of the skin. Christie Medical Holdings Inc. is owned by Christie Digital Systems Inc., a global visual technologies company and a subsidiary of Ushio Inc., Japan (JP:6925). For more information on Christie Digital Systems or Christie Medical Holdings, visit http://www.christiemed.com. For cautions associated to Christie Medical Holdings products, please visit http://www.christiemed.com/cautions.